Outside is a new feature so named for a number of reasons - the unconventional nature of the main system with its digital room correction and pro-world bass amp; the unusual comparisons; the regular solicitations of listener feedback from a small circle of fellow audiophiles who will create multiple points of view; and the deliberate pursuit of review subjects outside the beaten path. This first installment was never intended for publication. Rather, seeing a string of posts on AudioCircle created the idea to 'syndicate' them as a feature on 6moons. As such, this first installment is a mere introduction to the concept. It's not a formal and in-depth exploitation thereof. In the future, the various contributors with whom our writer is well acquainted will write at greater lengths and be more specific with their observations on whatever is being commented upon. Manufacturers submitting formal review loaners for the Outside features will ship to Mike Smith and afterwards issue the call-tag for his premises. Mike's circle of listeners will forward the items from one listening space to the next independently or congregate at Mike's place for joint listening sessions - Ed. Impressions are fickle and unreliable. Gear that was spectacular on the showroom floor can irritate over time. Overlooked and unexciting pieces can engender true love in time. We mistrust our own experience for sufficient time to become absolutely, completely, undeniably correct. Then, down the road, we realize that even the most careful statements can prove misguided. To some degree, this is borne from experience. We've been wrong before. In sharing with others, our doubt plus the curmudgeon factor (instilled in every audiophile I know) makes expression of any strong opinion by card-carrying members of our club a true wonder. What, you didn't get your card? Don't worry, I won't tell. For these and other reasons, it's easy to understand why reviews of audio equipment aren't shoot-from-the-hip affairs. The difficulty we all have in believing our ears and translating organic knowledge into the artificial construct of language is magnified by the responsibility of sharing experience with a broader audience. Knowing that this population places significant weight on the words is another sack of grain on our poor mule. For me, going from audiophile 'man on the street' to neophyte at a respected publication lends these thoughts a spotlight illumination. I've been writing my opinions on AudioCircle and the new AudioNervosa for a while and I'll admit that I'm sometimes quick with the keys. This version of me will endeavor to follow the carpenter's credo - "measure twice, cut once". This maiden feature is mostly a 'reprint' of one that 'ran' at AudioNervosa and AudioCircle a short time ago. To a large degree, it recklessly abandons the carpenter's credo. 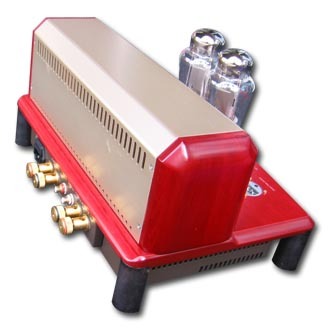 I have been a very happy Red Wine Audio customer and ordered one of the first pairs of Signature 70 monoblock amplifiers. 6moons recently did a review of these and earlier, of the stereo version, the Signature 30. Also, I bought a Yamamoto A-08s amplifier following the earlier 6moons review. Of course, it's more than luck that these amplifiers work well for me. The affinity of this iron for my speakers was forged on the familiar grounds of these prior reviews. Generally, my thoughts on these amplifiers track those already penned here (whew). Because these amplifiers have already been carefully documented, I'll not try to duplicate what has been done. However, I don't know anyone else who owns both. A little while back I had a gathering of Seattle audio heads under my roof who we were just hanging out and listening. Afterward, I had the thought that it would be interesting to get different opinions on these amplifiers. I collected the thoughts of the attendees, who were very good sports, then wrote my own impressions. Srajan indicated he'd be interested in putting the comparisons into a 6moons feature so I contacted the folks about elevating their comments. Those copied here allowed their inclusion. Without further delay, their comments followed by my own reactions to them. I had a recent in-home session with four other experienced audiophiles at my house. We spent about 4 hours with the following system: Modwright Music Hall CDP as transport to a TacT 2.2XP. Bass was to a Crown K2 on the rear subwoofer array on my Zu Definition Pros and the mains ran digital-out from the TacT to a Lessloss 2004 DAC. We split time between the Red Wine amps, which are about 50 wpc into the main array's 6 ohm load, and a Yamamoto A-08s, which produces about 2 watts. heavy bass lines we were playing. I checked the XO settings and saw that Yamamoto was running down to 40Hz instead of the intended 65. After correcting that, the little SET was comfortable for the rest of the session. As far as impressions go, I'd sent a link to this thread to the fellows that were there and invited their views. I weighed in a little later on . . . I'm one of the folks who listened in on this session. I'll confine my remarks to differences I heard in the presentation of the Red Wine Audio Signature 70s and the Yamamoto. Keeping in mind that this is the first time I've heard the RWA 70s and that I really only listened to one track (Bartok's Concerto for Orchestra, first movement) with which I was intimately familiar on both amps (and at differing volume levels, thus making the comparison more difficult), I liked both amps but clearly preferred the Yammy. Where the RWA was highly resolving to the point where I was a little distracted by some background noise on the recording (players making noise on stage), the Yammy had a more liquid, free-flowing sound that let me relax into the music. Timbres seemed more true to life with the tube amp as well. Transients were sharper with the RWA but I did not feel these were shortchanged with the tube amp. The deep bass performance was a non-issue since the Zu Definitions were separately powered at the lowest frequencies. However, both amps did well in the power zone of low to medium bass output. Bottom line is that both amps made music. For what it's worth, I generally prefer tubes to solid state and personally own Shindo electronics. As with the other two audio heads I really liked the Yamamoto, though in general I tend to prefer a more euphonic sound. This was my first experience with RWA amps and wow! They are mucho silent! They had superb blackness and tons of detail while maintaining a fairly musical presentation. The Yamamoto was liquid and supple while still keeping up with the subs. As with the RWA, I felt the Yammy was plenty detailed for me. On the cuts that I heard, I felt the Yammy was a much better fit with the rest of the equipment. My system has a warm and lush MC cart, a fairly neutral phonostage, preamp and amp all paired with my very revealing and neutral speakers. Everything is in fairly good balance for my taste. The Yamamoto fit more into this warm detailed taste for me. As for the Def Pros I felt that in general, the tonal balance from the front drivers to rear was quite seamless. Next time, I would really like to see the x-over points and the room correction profile on the Tact. As the afternoon rolled on, I was really starting to get into the Zu sound and appreciate the flat frequency response and wide soundstage. Of course memory is failing but I seem to remember more top end extension and air when I heard the Zu speakers last year at CES '06. With loudspeakers I always prefer an error of omission rather than addition. What the Defs did was really great and for me it really isn't too important if they have extension out to oblivion. Of course, my ears could have been messed up in some way. Oh, and get ready because next time I'm bringing some pipe organ music! I wanted to thank you for hosting us. I enjoyed meeting the others, and listening to your system was most enjoyable. Several things struck me. First and foremost, the wide range, great soundstage, detail and ambience retrieval was very enjoyable and top notch. Also, the dynamics were outstanding. The switch to the SE amp was very convincing for me. Overall I thought the system presented the liveliness of the music most enjoyably. I was also envious of the effective way you controlled the room without over damping it. A nice balance, I think. I miss the days when I had a free hand to tune my room. only intermittently noticeable and certainly not distracting from the excellent musical presentation. There are certainly traits of your system which I wish mine had more of, and I've never heard a system that truly had it all. I've been thinking quite a bit about a comment from above. This is regarding the preference for tubed gear over solid state, citing a particular distraction on the reference track of hearing the (unrelated?) nonmusical sounds of the performers going about their necessary human business. I am a fan of the sound tubes can provide, if not their idiosyncrasies which range from humorous to agonizing. Yet, this comment gave me pause. Of course, honest retrieval of these types of noises is a great goal of audiophilia, right? Hearing audience members shifting in their seats on a recording is a memorable event, to be marked on the calendar. Yet here is an experienced audiophile citing same as a distraction from the musical message. 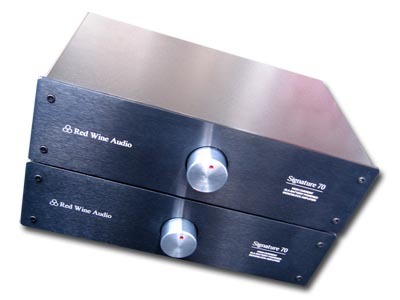 The Red Wine Audio Signature 70 monoblock amplifiers in question have been hailed as SET solid state. But, I don't think anyone at the Sunday session confused the RWAs with the Yamamoto - they have important, divergent musical traits. My opinion is they share many skills as well. Grain, especially in the treble region, is often aligned with solid state amplifiers by tube-o-philes. The Signature 70 amps are utterly smooth. Tubes can be most adept at riding the nuance of instruments. A saxophone note quavers and darts in a split second. Lithe tracking of faint transitions is a major advantage of tubes which most solid state gear cannot match. Again, the Red Wine amps give up nothing to a great tube amp here. 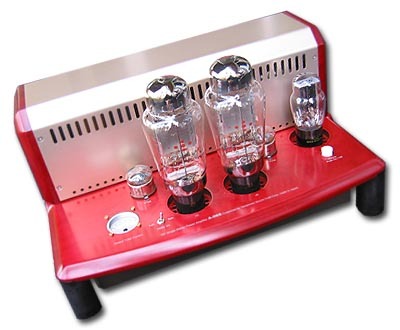 These two similarities are significant and by themselves make the Signature 70 amplifiers a big step toward creating a Great Tube Experience without the glowing bottles (hey, the red power lights kind of glow though). Now, the differences: Properly implemented, tubes have something of a quirky artificial intelligence. Not everyone will appreciate it. They decide what is important and emphasize that. Minor sounds and details are shuffled backward or off the stage entirely and the lead singer or guitarist is pushed to the front. Dynamic contrasts between main and ancillary performers are accentuated, which has an immersive and powerful effect. A related phenomenon is their rubber band factor. The transient strike is, to varying degrees, recessed. It might not be noticeable without direct comparison. Then, they make up for that lag with a jump through the power of the note with a languid and lingering finish. These two elements combine to serve an intimate and addicting version of the performance. While details might be softened or lost, the overall performance, the meat of it, may be heightened. These ancillaries are a core strength of the Yamamoto, while the Red Wine amps take neutral ground and serve all the detail, albeit in proper context. These are gross generalizations. They do describe my experience with these amplifiers though. Chasing detail can be exciting. Right now, I'm listening to Patricia Barber's sublime Cafe Blue. On the Red Wine amps, the band is kept together tightly and all parts are in step even in the chaos this band dips into from time to time. It is wonderful. Yet, on the last CD, JJ Cale with Eric Clapton The Road to Escondido, I was thinking the cymbals were too prominent and somewhat hard. Last week when the Yamamoto was in the system this was less of a concern. In pursuing neutrality and detail, honorable though that may be, recording quality becomes increasingly important. These traits punish poor recordings more severely than systems directed at tonal development and dynamics. The latter seem to bring the best out of what's on the record where the former exposes the nits. Both can sound great. Followers of the respective camps can rightfully fault the other. As with everything audio, it's about learning what you value first, then following that vision. I was not able to make the big get-together last week but got to spend about three hours at Mike's today. I really liked what I heard with the RWA/Lessloss combo. We listened to a variety of music at semi-low volumes. Even at this low volume, I felt that nothing was missing. The combo was certainly the most detailed I have heard his system to date. Even with all this detail, nothing sounded artificial or hopped up. It all came across in a very natural and organic way. The last time I heard his system, his bass array was being powered by a Hafler amp, not sure what model it was (DH-200?). He is now using a Crown amp that I believe puts out about 500wpc. One may think that is overkill on such a high efficiency set of speakers but we are talking about eight 10" drivers. The proof was in the listening and the bass was again the best I have heard in his system. While playing the CD Yello - The Eye, you could feel the bass starting to energize the room and wanting to kick you in the chest. It was very taut and controlled with no bloat at all. Overall a very fun listening experience. Looking forward to hearing it again when we can really crank it up and see what she can do! 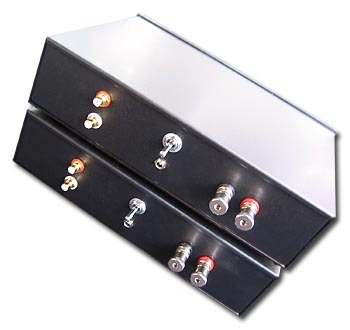 In most applications, the comparisons between these amplifiers would be terribly lopsided. The 2wpc Yamamoto wouldn't function. Because of the efficiency and flexibility of my rig, I was able to assemble this comparison without the obvious penalty that would be in play nearly everywhere else. The fact that the Signatures can hang at all with the Yamamoto in this context is a supreme compliment. Now, whether the comparison has any value in a general setting is dubious. You'll certainly know for your own speakers. I hope to utilize this listening group format in features to come. How exactly it will work is unknown and it probably will vary depending on any given assignment. But to me it makes sense to try things out in different systems, with as many ears as possible. I trust my own ears but someone else might be in the same session with me and react differently. We're all on the same journey but like it or not, we all have to take separate paths. It leads to a wonderfully disconcerting galaxy of choices. More stars equals better triangulation though in this navigational Dark Age and I'll try to establish as many data points as possible.